Shoveling and sweeping to expose still-hidden portions of a 1,600-square-foot marble mosaic that dates to Roman times, a University of Nebraska-Lincoln archaeological team this past summer unearthed a new treasure in southern Turkey. Lying face down in more than a millennium of soil was a life-size marble head, the remnant of a sculpture of the goddess Aphrodite – still beautiful, though scarred by chips on its nose and face. The sculpture’s body was missing, likely incinerated in a lime kiln many centuries ago. By somehow escaping destruction, Aphrodite’s head provides yet another telling detail about how profoundly the region was affected by Greek and Roman culture during the first and second centuries, said project director Michael Hoff, Hixson-Lied professor of art history at UNL. Hoff returned to Nebraska in late August after spending nearly three months in Turkey. 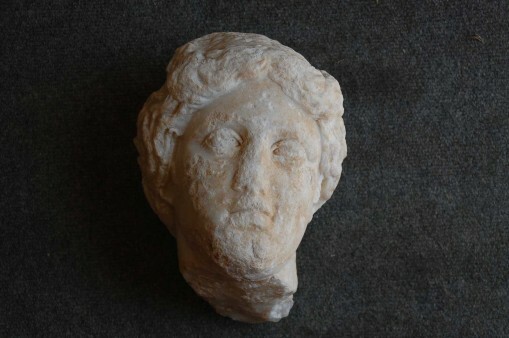 The head, Hoff said, is the only piece of monumental sculpture recovered so far in an eight-year archaeological dig at the site of Antiochia ad Cragnum (Antioch on the cliffs), an ancient Mediterranean city that once numbered perhaps 8,000 people. Last year, Hoff’s team discovered a mosaic thought to be the largest of its type in the region. Archaeologists believe it adorned an open-air plaza outside a soaring, 60-foot-high Roman bath house. Aphrodite’s head was a highlight of a 2013 excavation that also uncovered the vestiges of what appears to be a temple, with a second marble mosaic covering its interior floor. It is unusual to find a mosaic floor in a temple, Hoff said. His next step is to research other examples to learn more about how mosaics relate to temple architecture. 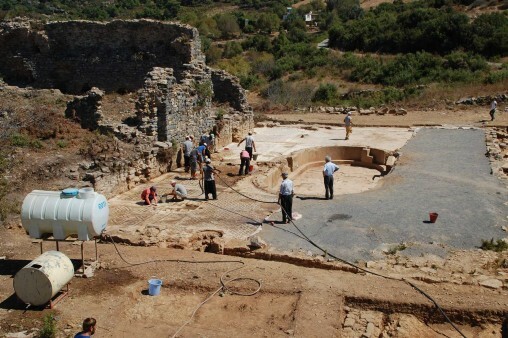 With assistance from Clark University in Worcester, Mass., and Ataturk University in Turkey, the project has excavated sites in a 200-square kilometer area where Antiochia was located. The project’s co-directors are Rhys Townsend, an art history professor at Clark University; Ece Erdogmus, a native of Turkey who is an architectural engineering professor at NU’s Peter Kiewit Institute in Omaha; and Birol Can, an associate professor of archaeology at Ataturk University. One of Erdogmus’ roles is to help reassemble the stones of another temple located not far from the site of the bathhouse. The new discoveries add evidence that early residents of Antiochia – which was established at about the time of Emperor Nero in the middle of the first century and flourished during the height of the Roman Empire – adopted many of the trappings of Roman civilization, though they lived in relative isolation a thousand miles from Rome. In the past, scholars believed the region’s culture had been too insular to be heavily impacted by Rome. Yet Hoff and his team have found many signs that contradict that belief. Before the city was founded, the region had been a haven for pirates, including the Cilician pirates who kidnapped Julius Caesar in about 75 B.C. Francis Beaufort, an officer in the British Royal Navy, identified Antiochia’s location in the early 19th century using a guide written by the ancient Roman geographer Ptolemy. Time, and probably Christian vandals, erased much of the evidence of Antiochia. The bath’s vaulted ceilings may have collapsed in an earthquake. By the third century, Rome’s influence was disrupted by insurrections and rampaging armies. By the fourth century, the area was a key site in the development of Christianity – and Hoff suspects that radical Christians destroyed many of the marble statues and reliefs in an effort to eliminate pagan idolatry. The archaeological team has found evidence of lime kilns near the site, leading Hoff to believe many statues and marble panels were burned to make slaked lime used in concrete. It also appears that at about the same time, the sturdy floor created by the plaza mosaic was used as the base for a glass-blowing furnace. The glass furnace dates to the late Roman period, which began in the middle of the fourth century, Hoff said. He is now convinced that the bath and temple and their mosaics date to the late second or early third century. Only about half the plaza mosaic was excavated in 2012. The archaeologists returned to the site this summer to excavate its west half. Their efforts included clearing out a 50-foot long, marble-lined swimming pool in the center of the plaza. They found two stairways leading into the oval pool, as well as built-in benches along its inner sides. The team turned its shovels toward a mound just south of the plaza, where toppled columns lay half-buried. Telltale signs in the layout make the archaeologists believe the building had been a Roman temple, though that has yet to be confirmed. While the larger bath plaza mosaic features large patterned areas, the temple mosaic uses smaller tesserae to compose geometric designs, as well as images of fruit and floral images amidst a chain guilloche of interlocking circles. The temple mosaic measures about 600 square feet. Though both mosaics are “spectacular,” the temple mosaic is definitely different from the much larger plaza mosaic, Hoff said. “I don’t think they are connected,” he said. 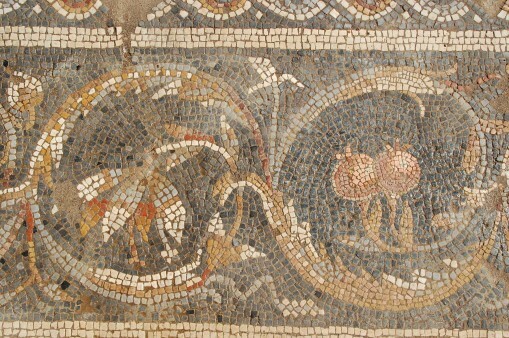 The two mosaics likely were designed by different artists, with wealthy patrons of the region hiring itinerant contractors to construct the buildings for public use. Conservators followed the archaeological team to protect the mosaics from additional damage and to repair damaged areas with special mortar. Though the mosaics eventually will be prepared for public display, they now are covered with a conservation blanket and a thick layer of sand. The rubble of the bath’s collapsed ceilings will be cleared during a future excavation season. Parts of the stone substructure of the bath’s walls have remained standing, their marble veneer long missing. Local lore was that treasure was buried at the site. Hoff said the excavations have, indeed, yielded treasures – though perhaps not those anticipated by legend.